It is a ritual that all motorists go through, driving into a petrol station to fill their vehicle’s tank up, then once done, drive off to their destinations only to repeat the same routine again regularly. But what most drivers aren’t aware of are the strict safety rules that govern a petrol station. A stray spark – even from using a mobile phone, or a cigarette – could lead to a fire incident. 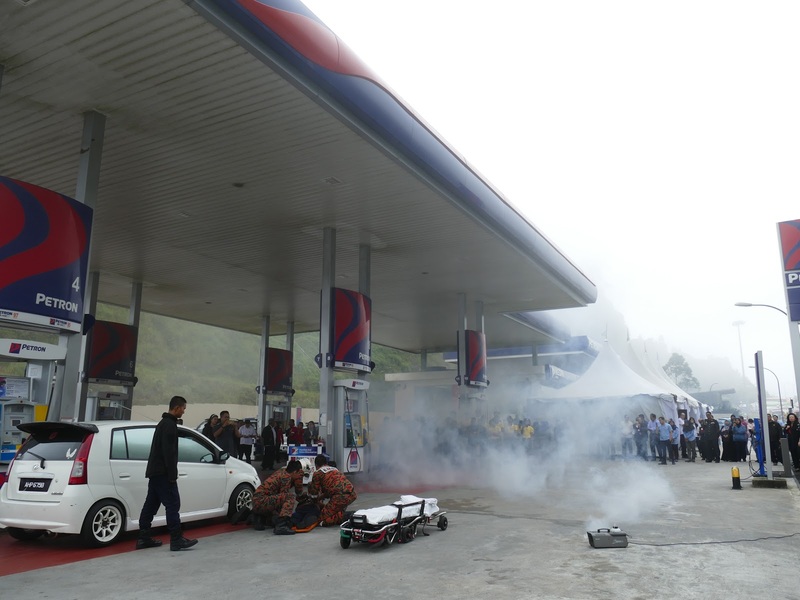 In recognition of the need to educate drivers, consumers and station operators of proper behaviour at petrol stations, the Malaysian Ministry of Domestic Trade, Cooperative and Consumer Affairs (KPDNHEP), Pahang State Securities, Resorts World Genting and fuel retailer Petron jointly organised a Petroleum Station Safety Awareness Campaign on 30 October 2018. Held at the Petron station at Genting Highlands, Pahang today, the event was attended by Dato Mark bin Ujin (Director of Domestic Trade and Consumer Affairs), Afizah Azleen Abd Rahim (KPDNHEP Chief Section of Domestic Trade for Pahang), Abdul Mubin Ahmad (KPDNHEP Chief Branch of Raub, Pahang), Khor Hai Peng (Vice President of Security for Resorts World Genting), Katherine Chew (Vice President of Resort Communication and Public Relations for Resorts World Genting), Sa'ado Sharif (Government Liaison Manager of Petron), Azizon binti Abdul Aziz (Area Manager Representative of Petron) and more than 100 members of the public. Dato Mark bin Ujin officiated the event as he lit a torch with the help of the Malaysian Fire and Rescue Department (JBPM) of Genting Highlands. The members of the JBPM then conducted the petroleum safety awareness briefing and demonstrating proper etiquette and procedure. This is of utmost importance, given the potential severity of a fire incident. They explained that the public should not be afraid to tackle a fire at the root. For example, if a fire starts out at a gas cylinder, it can be stopped just by carefully placing a finger over the mouth gas outlet to immediately stop the flow of the gas. They also conducted an exciting demonstration with a Fire & Rescue truck, clarifying that it is a myth that cars will explode if they catch on fire. Two men enacted an accident by smoking and talking on the phone at the petrol station whilst pumping petrol where the car caught on fire and the men fell back and collapsed on the ground. The team responded by quickly arriving on the scene to put out the fire and carry out medical assistance for the men. Vigilance is important to ensure that safety is adhered. Petroleum products are highly flammable, and a typical petrol station would not only contain huge volumes of gasoline and diesel in underground tanks, but also fuel vapours caused by evaporation – which are even more flammable than the liquids themselves – and other flammable produces like lubricants, liquefied petroleum gas (LPG) and greases. 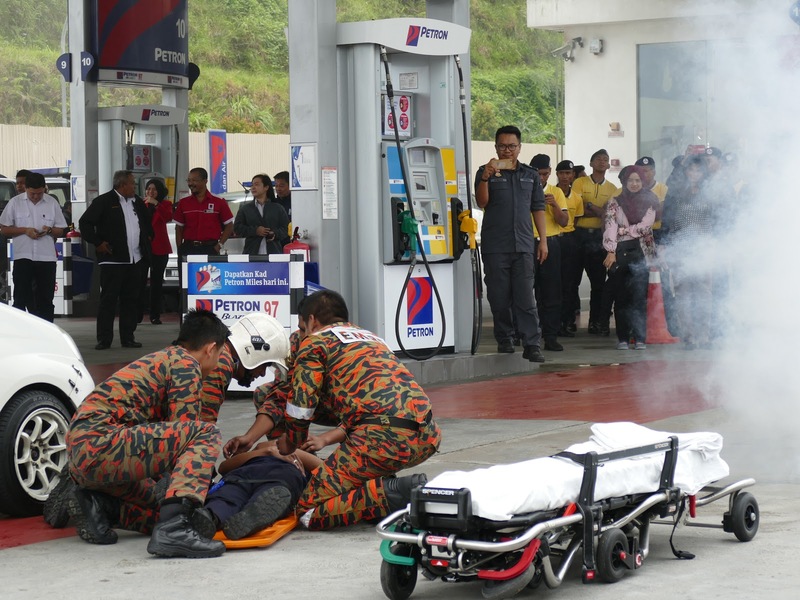 All petrol stations in Malaysia are required by law to display safety rules and regulations, but negligence or ignorance of consumers present the risk of accidents. In addition to the dos-and-don’ts of the petrol refueling process, the vigilant Fire and Rescue Department members will also be highlighting the importance of regular vehicle servicing, road safety measures and the role of property operators like Resorts World Genting in road maintenance. The event is a crucial one to educate visitors as to reach the peak at 6000 feet, a high volume of vehicles such as buses, cars, motorcycles and other vehicles patronise the roads leading up. In 2017 alone, Resorts World Genting recorded nearly 24 million visitors. Khor Hai Peng, Vice President of Security for Resorts World Genting added, “Besides ensuring that our visitors have an unforgettable time at Resorts World Genting, our utmost commitment is ensuring that the safety of our guests and staff remains a priority. Through this event, I hope that the awareness of the importance of petroleum safety will be widespread amongst our staff and customers when pumping petrol. I hope they will learn today that each of them plays a part as drivers and consumers. Fire safety is one of the top risks that we handle here and we are fortunate to have our own Fire & Rescue team with force of 200 to respond to crises instantly. We hope that by working together with Petron, the public, especially the citizens of Malaysia will be more conscious about this issue." A ‘Smart Consumer’ quiz was also held with souvenirs sponsored by Petron and KPDNHEP where the audience had a fun time answering questions. 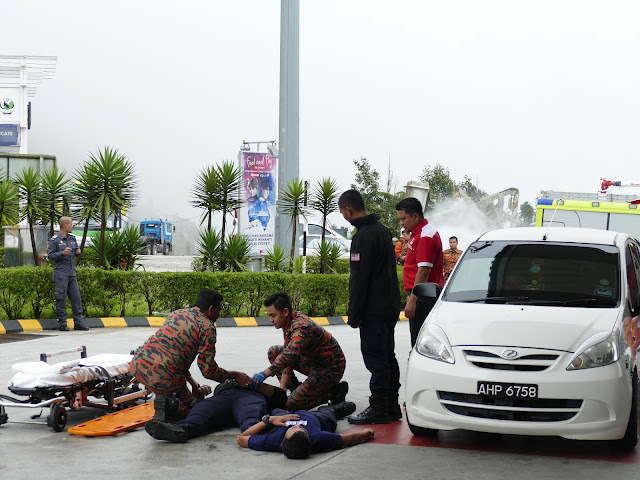 While the event is meant to educate and highlight the strict safety procedures practiced at Resorts World Genting, the lessons that were be given out at the Petroleum Safety Awareness Campaign on 30 October 2018 will be applicable to all drivers and consumers, not just in Pahang but throughout Malaysia. Teringat dulu zaman sekolah ada aktiviti camni. Baguslah sentiasa ada awareness kempen supaya semua alert tak kira dimana kita berada. Setuju sebab kempen macam ini baik untuk semua.